Toraja Death Rituals: Cave Burials, Effigies.. and the Walking Dead! Tana Toraja is a region of South Sulawesi in Indonesia, a picturesque mountainous region that is home to an indigenous group known as the Torajans. For the Torajans, the most important thing about life is death and because of this, they have established some of the most unique and complex burial rituals in the world, which continue to be practiced today. 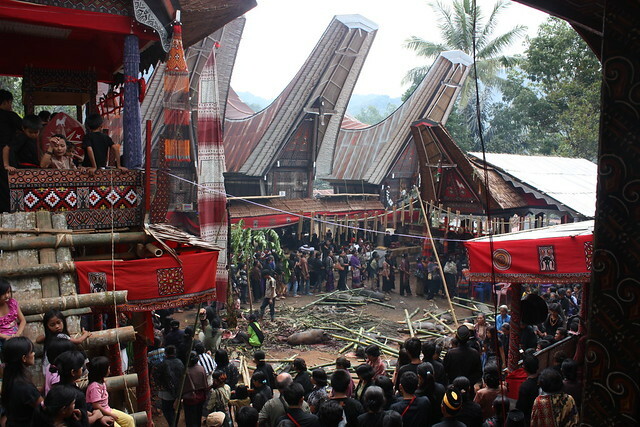 But don’t worry, this article – although it may appear somewhat dark (and potentially gruesome and/or shocking) for some people, it is not in the least bit morbid, as these Toraja Death Rituals are one of the biggest celebrations of life you will ever read about. Toraja Death Rituals: Cave Burials, Effigies and the Walking Dead! Trigger Warning: This post contains images of coffins, human bones & skulls and effigies. If you’d like a bit more of an intro to Torajan Culture, hop on over to my post about Tana Toraja’s Culture Highlights & Things to do in Indonesia’s Highlands and for those wanting to cast the net a little wider check out my Bucket List Guide to Indonesia which has all the best places to visit across the 17,000 islands! The Torajans work hard in life to amass wealth for their death, with elaborate funeral rites the ultimate symbol of wealth and prosperity to those both inside and outside the community. The biggest and most lavish festivities are reserved for those of noble standing within the community, with the last ‘pure blooded Torajan noble’ buried in 1972, and event which was documented by National Geographic. What Happens When a Torajan Dies? The Torajan’s believe that death is not instantaneous, but rather it can take months or even years for a person to fully pass over to Puya (the afterlife), and that this can only occur after the body is buried. Until the time of burial the deceased body is kept in the family home, and thought of as a ‘Makula‘ – a ‘sick person’. 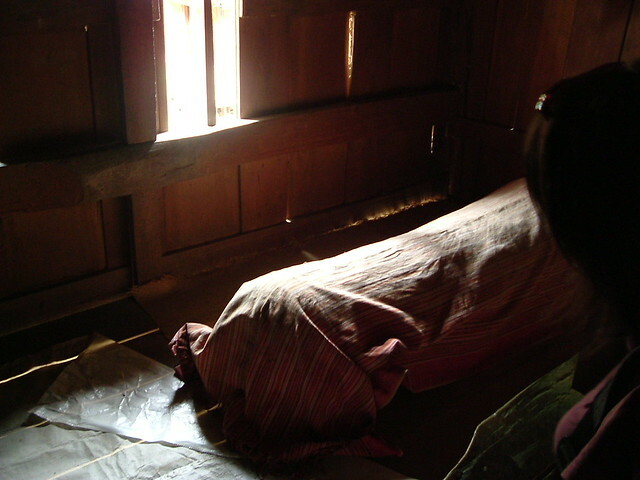 In order to prevent the body from decaying and putrefying, it was traditionally wrapped in blankets and preserved with herbal elixirs and smoldering fires – although this has largely died out and the bodies are now preserved with formalin (formaldehyde and water) injections, which eventually results in mummification. The body is kept in a room at the back of the family home, facing south where the Torajan’s believe heaven is located, and is tended to by family members almost around the clock for months/years whilst they prepare financially and emotionally for the funeral. Each day family members will visit the body, talk to body and bring it food and drink up to 4 times a day. The Torajan’s do this out of great respect for the deceased on the premise that although he is ‘Makula‘ his soul remains in the house, and whilst he is in the house he continues to remain a part of the family. Visitors to the house will be introduced to the deceased and great care will be taken to include the deceased in household life. A Tau Tau is a carved wooden or bamboo effigy of the deceased that is usually commissioned upon a person’s death. Tau translates as ‘man‘ and so Tau Tau translates as ‘men‘ or ‘statue‘. Traditionally they were only carved to reveal the gender of their subject but they have become more and more extravagant and a likeness to the deceased is now expected, as is being dressed in an outfit formerly owned by the deceased. At a cost of over $1,500, they are an extravagance usually reserved for those with higher standing with society. Once created, the Tau Tau remains with the body and is transferred to a lookout above the cave grave entrance at the time of burial. The Tau Tau are thought to protect the deceased and watch over the living. A standard black water buffalo costs around $5,500. Albino buffalo are rare, prized and considerably more expensive. The wealth of the deceased will dictate the extravagance of the funeral ceremony, and families can take years to amass the wealth and sacrificial animals required before it can be performed. A minimum of 6 water buffalo (at over 100 Million Rupiah each!) are sacrificed at a Torajan funeral, but can be as many as 100 buffalo for those thought of as noble people with high standing in society. (You can probably understand now why it takes so long for the family to collect the required animals and, from a practical reason, why funerals take place so long after death!) The Torajans believe that the buffalo help take the deceased to Puya and that many buffalo will make the journey quicker. The buffalo are slaughtered by having their throat cut to release the spirit and the horns removed to decorate the front of the deceased families home. Guests to the funeral often also arrive with a pig or buffalo to be sacrificed as a gift to the deceased relatives, and who’s donations are meticulously recorded in order to be repaid at a later date when a member of that family dies, and until such time there is an unseverable bond between the families. A cockfight or ‘bulangan londong’ is also an integral part of the ceremony. As with the sacrifice of the buffalo and the pigs, the cockfight is considered sacred because it involves the spilling of blood on the earth. Officially, the tradition requires the sacrifice of at least three chickens, but it is common for at least 25 pairs of chickens to be set against each other, as part of the ceremony. The Rambu Solo is the official name of the funeral ceremony (also known as the Death Perfection ceremony) and can take place in the dry season between the months of June and September each year. This is carried out either outside the Tongkoran (traditional house) in the village or in a field (the ceremonial site is known as rante) where bamboo structures are erected for friends and family to watch the festivities from. It is at this time there is lots of wailing, crying, dancing and singing, and when the animals are ritually sacrificed, and the cockfights occur. The meat from the animals is eaten as part of the death feast, with the extra meat split between the attending families to take home. Although the aluk religion (the way of the ancestors) states that only a noble person should be celebrated with a death feast, it has become an integral part of all funeral ceremonies now, with the exception of ceremonies for children and low-status adults.. These festivities can run for 2 days or up to 2 weeks depending on the status of the deceased. After which, the body is placed in ceremonial palaquin (which is the shape of a traditional house – Tongkoran) and carried by many men – and accompanied by members of the village – to the burial site behind a procession known as Ma’Palao/Ma’Pasonglo. This is the cave burial site of Londa – and if you look closely you can just make out the coffin hanging from just above the center of the cliff side. The deceased is traditionally buried in a hollowed out cliffside grave that sometimes are as high as 30 meters off the ground. These caves have been hollowed by specialists, who carried out the work without the use of harnesses or safety nets, in exchange for very little pay or sometimes, a couple of buffalo. Generally, the higher up the body is buried, the higher the deceased status in society, and whom had been buried with symbols of their wealth such as gold. The bodies were deliberately placed in hard to reach places to discourage grave robbing. This sometimes included hanging the coffin from the side of the cliff where it remained until the ropes snapped or coffin disintegrated and the remains fell to the ground. Generally speaking, the lower your status in the family, the lower in the cave you were buried, but this is always above ground. This is because the Torjans believe that the earth represents the mother, who gives life through the land, and to bury bodies in the ground would, in essence, defile that purity. Babies and young children, who have not yet grown teeth at the point of their death are not buried in the manner described above, but rather are wrapped in cloth and placed into a hollowed-out tree trunk and then covered with a palm fiber door. The Torajans believe that when the tree beings to heal, the child’s essence will be one with the tree. The Ma’Nene festival, carried out in August and translated as the the Ceremonial Cleaning of Corpses. It is often referred to as the ‘second funeral’ and is when relatives of the deceased remove their loved ones from their final resting place to clean the body and dress them in new clothes. During this ceremony, the corpses are often exhibited in the village and paraded around the streets and hence where the ‘walking dead’ references have come from. They do this out of great respect for the dead and often re-inter them with money, cigarettes or clothes (or other things!) that they will need in the afterlife. Whilst it is possible to visit Toraja at any time of the year, if you want to witness a Rambu Solo or Ma’Nene Celebration, it would be best to time your visit between August and September. The Torajans are happy to welcome visitors to the festivities believing having international visitors in attendance will increase their status in society. Get in touch with the Torajan Tourism Board prior to your visit and they will help point you in the right direction of various celebrations going on in the region. Internal flight to Palopo (approx 40 mins) followed by a 2.5 hour rive to Tana Toraja. Search flights here. 7-8 Hour Bus from Makassar to Torajaland. Some buses have air conditioning but not all have toilets. Buy your tickets here. This beautiful hotels sits 700m above sea level with sweeping views of the surrounding hills. The rooms have been built in the style of a traditional Tongkonan and are tastefully decorated inside. The hotel has an outdoor pool, spa, an onsite restaurant & bar and offers free wifi throughout the property. Or If you have specific accommodation requirements, check out other Hotels in Tana Toraja to narrow down your search. And that’s a wrap folks! I hope this in depth travel guide has given you an enjoyable sneak peek into the fascinating and complex Toraja death rituals..
..Let me know in the comments below if this is something you would like to see with your own eyes! FYI: I visited Tana Toraja as part of the Wonderful Indonesia Trip of Wonders 2017 – and I was so fascinated by the rich cultural history and traditions of the region, I couldn’t help but write about it! Indonesia: The Best Restaurants in Seminyak and where to eat in Bali on any budget! The Philippines: Top Things to do in Palawan + Where to Stay & How to get around! The Maldives: Plan the Perfect Trip the Maldives with Options to Suit Every Budget! Join over 120,000 travel lovers and get monthly updates direct to your inbox. Itineries, tips, stories and giveaways - exclusive to MakeTimeToSeeTheWorld subscribers! PLUS a FREE Travel Packing Checklist or FREE Roadtrip Packing List to help get you on the road! We hate spam too. Your email address will not shared with anyone else. Hi There! Thanks for reading my post about Toraja Death Rituals: Cave Burials, Effigies and the Walking Dead! I just wanted to let you know that this travel guide contains affiliate links, which means if you purchase something after clicking a link, I may get a small commission – which is at absolutely no cost to you. If you enjoyed this article and are going to be searching for some of the things I mention anyway, I would love it if you could click through from the links above & thank you in advance! Read my full Disclosure here. Vicki is the Lawyer turned Content Creator, Editor-in-Chief and all round Boss Lady at MakeTimeToSeeTheWorld. She has lived and worked in 7 different countries and started the site to show everyone that it is possible to travel whilst holding down a full time job (because not everyone can - or wants to - quit and walk away from it all). Her style of travel has always been to get the best out of a destination as a time poor traveler making the most of limited vacation days and all without breaking the bank; BUT she does know where to save and where to splurge to have the most incredible travel experiences - such as luxury hotels and over-water bungalows, safaris, spas and more(!) - where the situation calls for it. If you want to join the work to travel revolution, follow MakeTimeToSeeTheWorld on Facebook, Twitter, Pinterest or Instagram - and if you are a travel brand who would like to find out how to work with Vicki, contact her here. Eeek! This post was rather morbid. That being said, it was interesting to learn about those unique Toraja death rituals. It’s amazing that they spend so much on funerals, the same someone of another culture would spend on a wedding! I am definitely not comfortable with looking at photos of skulls and coffins. But I felt that this was such an enlightening post. I love learning about the culture of other countries. And this dark side of the culture is still part of the culture. Wow this place looks stunning when I look at nature. But looking at all the dead people, I think I would be rather scared… It’s good though to learn about those traditions. What a fascinating culture. I’d be a little freaked out if my dead relative’s body was kept in the house, even if they were in the back of the house. It’s always fascinating to learn how other cultures honor their dead. I’d be totally the same Debra. It was quite confronting when I was there, and if I’m honest, I’m glad I didn’t see any of the ‘fresher’ dead bodies in family homes. But it is fascinating. For me I think the belief that death is not instantaneous but a gradual process, unlike the West where our deceased are cremated or buried within days, is something we can learn from on an emotional level. But I would definitely still have to draw the line at dead bodies in the house. The ceremonial dressing of the corpses is a freaking thing. It would be so scary to dress them. Its strange how different cultured conduct different burial ceremonies. Only have been to Bali in Indonesia. Would love to come back and visit the mountainous regions and learn more about its culture. Not too sure if would be comfortable around skulls and coffins but would love to test it! This article freaked me out. Coz I get scared by seeing bones and skulls. In fact, this is not the first time I was reading about such a ritual. I experienced the same in Phillippines Sagada district too. They have hanging coffins too. Tana Toraja seems like a region I would definitely love to explore! Your post was so intriguing and motivating. Keep up the awesome work! Thank you so much Agness! It really was a fascinating place! Copyright © 2019 maketimetoseetheworld.com. All Rights Reserved.